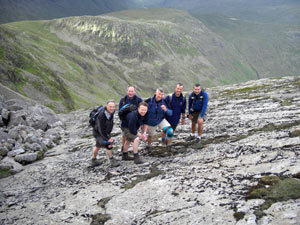 This challenge is a traverse of the high ground encircling the Mickleden valley in Great Langdale, visiting the summits of 6 mountains on the way - Pavey Ark, Harrison Stickle, Loft crag, Pike O'Stickle, Rossett Pike and Bowfell. This route takes in the famous and spectacular Langdale Pikes and culminates on one of the most distinctive mountains in the district - Bowfell. The route can be done either way but is best if done in an anti-clockwise direction - this is how we describe it here. Great Langdale is of historical importance having been inhabited for thousands of years. It has lots of sites of archaeological significance and is believed to have been a major centre for the production of stone axes during the Neolithic period. Mickleden in particular is rich in evidence of previous inhabitants with footings of buildings long since disappeared still idnetifiable. One example is a long house in the shape of a Viking ship which archaeologists are quite excited about! There is so much of interest on this route you could spend days here and only scratch the surface. Well worth a return visit! We start this route at The New Dungeon Ghyll Inn and head behind it towards Mill Gill (now more frequently referred to as Stickle Gill) which we follow on a recently reconstructed stone pitched path to Stickle Tarn. 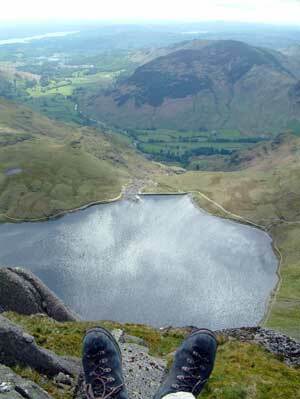 Stickle Tarn is dammed at one end and was used to supply water to the former gunpowder fatory in Elterwater. As you near the tarn ftrom Mill Gill, the first objective of the day, Pavey Ark, suddenly bursts on the scene before you. We tackle Pavey Ark by the easy North Rake although there are much more exciting routes such as the famous grade 1 scramble of Jack's Rake. 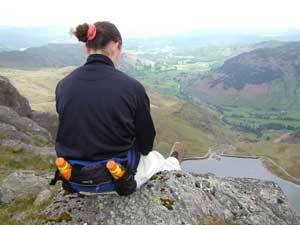 From Pavey Ark we head over to Harrison Stickle then to Loft Crag and Pike O'Stickle. Pike O'Stickle is probably the most recognisable of the Langdale Pikes from a distance as it forms a shapely symetrical cone when viewed from all directions. This is home to one of the sites where, in prehistoric times, stone axes were fashioned out of a particularly tough rock found here. We eventually leave the Langdale Pikes behind and make our way to Rossett Pike at the head of the Mickleden valley and from there to our final top of the day, Bowfell. 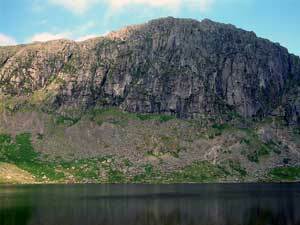 Bowfell's summit is every bit as rugged as Scafell Pike's though more compact. Conditions permitting we'll descend from here to Great Langdale via the Great Slab, a tilted mass of almost flat rock which has to be seen to be believed. This area is a geologists' heaven as evidence of the turbulent volcanic history and formation of the region is so clearly on display. From the Great Slab we access 'The Band' via the climber's traverse and dewscend to the valley below. Alternatively we access 'The Band' by the more usual route via 'Three Tarns' and finish the day back at our starting point.